Romanian game developers were given a major boost at the Dev.Play conference in Bucharest today, when the national communications minister announced a €94 million investment fund for tech companies. While that money will be available to all companies in the country's tech sector, the games industry is especially well placed to benefit from the fund; international publishers such as EA, Ubisoft, Bandai Namco and King all have offices in Romania, which often serve as co-development studios on major franchises. That environment has spawned a thriving indie scene, composed of dozens of smaller studios for which funding is a major problem. "A very important support scheme for the Romanian games industry is being worked on as we speak"
"If we look at countries with a very developed games industry, such as the US, or Canada, or the UK, there are always several key elements there," said Catalin Butnariu, founder of Dev.Play, in his opening address at the conference today. "You have a healthy startup and investment scene, you have government backing and support from local authorities, you have networking opportunities through conferences and other events, and you have an educational system that brings new qualified staff to fuel the sector." Butnariu, who is also president of the Romanian Game Developers Association, started Dev.Play to address one aspect of creating a healthy ecosystem in the country, in the belief that the others would eventually follow. It was not, he said, about creating "just another games conference." "There are already so many of them in Europe," he added. "For us, it was a necessary step toward building such an ecosystem in Romania, and more generally speaking Eastern Europe." Eastern Europe has "many thousands" of people working in game development, and Romania has emerged - alongside Poland - as the region's most important single country. According to Butnariu, his work has involved, "a significant effort to make sure that the potential of our industry is acknowledged by key Romanian authorities, and an effort to focus on finding the best approaches and solutions, which will enable us to further develop as an industry." 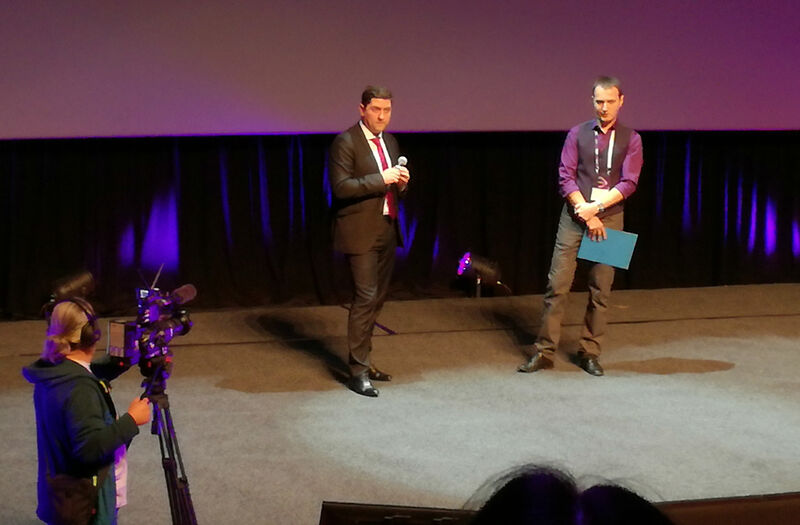 And that labour has borne fruit, with Butnariu telling the audience that "a very important support scheme is being worked on as we speak," and welcoming Petru Bogdan Cojocaru, the Romanian Minister for Communications and Information Society, onto the stage to explain more. Cojocaru, whose comments were translated into English by Butnariu, described the growth of the games industry as a "positive trend" for the country as a whole, and reflected on his experiences of the Dev.Play expo floor. "If this scheme proves successful, it will open the way for other support mechanisms and additional funding"
"There are some games developed by small teams - teams as small as one person sometimes - and there are also medium companies and large companies with teams of tens or hundreds of people," he said. "It's important to keep that in mind, because a successful support scheme for such an industry needs to take into account all possible actors in the sector." The "support scheme," which will officially launch in the coming weeks, will make investments of between €500,000 and €3 million into individual projects over the next three years, from a fund of €94 million. Only companies with "100 per cent Romanian capital" will be eligible, and Cojocaru suggested that this could be the first example of an ongoing commitment from government. "This should provide very good support for all types of projects, and all sizes of projects," he said. "If this scheme proves successful, it will open the way for other support mechanisms and additional funding. For now, we are starting with this amount, which we're sure can be implemented." Cojocaru closed with a sobering reminder that, "whether [the attendees] like it or not," the Romanian games industry isn't a point of discussion within, "the government or other official circles." However, Cojocaru put himself forward to be "an ambassador" for the national industry, which he believes can drive the growth of the tech sector as a whole. 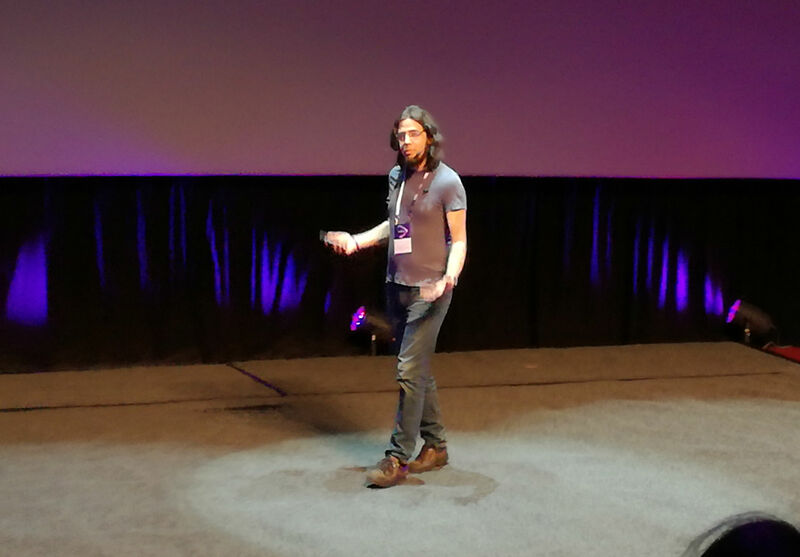 The potential importance of the money available through the €94 million investment fund was reinforced by the next talk at Dev.Play, given by Vlambeer co-founder Rami Ismail. When Ismail walked on the stage, he first celebrated the Romanian government's decision to show support with "a good amount of money" for the country's developers. Indeed, he stated that Romania's "rapidly growing" development scene is in a "really interesting spot," based on his experiences travelling the world and visiting a wide variety of industry communities - for which he received the Ambassador award at GDC this year. According to Ismail, each of those communities can be placed in one of six different stages of evolution. "You're making games that are specifically Romanian, that can only be made by somebody in Romania. I find that very exciting"
"The first one is where nobody knows each other, and everybody is making games on their own," he said. "The second stage is where they've just started to meet each other and they throw little events; usually 20 or 30 people all from one city or one place, because people won't travel for events like that." In the third stage those events starts to grow, just as Dev.Play has grown in the three years since Ismail was first invited. People from all over the country will travel to be there, and certain people and companies from the international industry will start to visit. "That's a big difference," Ismail continued. "It means that the industry grows, it means that international companies are starting to put studios here and invest money here. "What happens next [in stage four] is a hero emerges. And I hate the word hero, but the idea is that somebody will do something very successful; whether that's starting a studio that's very successful, or making a game that's very successful, or they'll make an investment deal that makes a lot of money - it doesn't really matter. Somebody will be the first to do something really big." That success can become a focal point for the community, Ismail explained, inspiring a new wave of developers to match or eclipse it, and leading to a host of strong products as a result. "At that point you are your own industry," Ismail said. "At that point you create your own opportunities and your own problems." Romania's "hero" still hasn't emerged yet, but the investments made from the new fund could be the catalyst that allows it to happen - that takes the country's industry from the third of Ismail's stages to the fourth. "I believe that you all are somewhere between three and four," he told the crowd. "You have this rapidly growing, rapidly expanding industry, you have international players here. You're finding your own identity, and you're making games that are specifically Romanian, that can only be made by somebody in Romania. I find that very exciting."